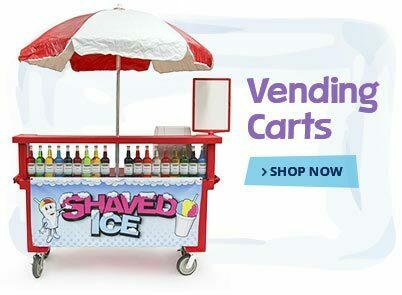 Whether you are running your business from a portable roadside stand, a mobile concession trailer, or a permanent shop, having a good stock of serving supplies is important to your success. You'll want your product to stand out from the competition so bright and fun disposables are a must. 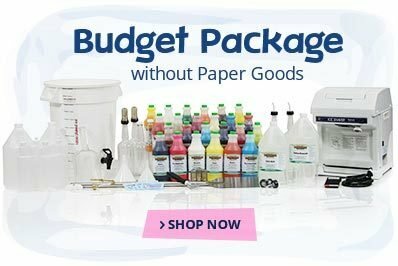 We offer a full line of servings supplies and disposables from cups to napkins and everything in between. Below are some products we recommend. Over the years we have seen shaved ice served in a variety of containers. Some of these containers included wax cups, foam cups, Chinese take-out containers and novelty plastic containers. We find that most people use insulated foam cups at their stands. 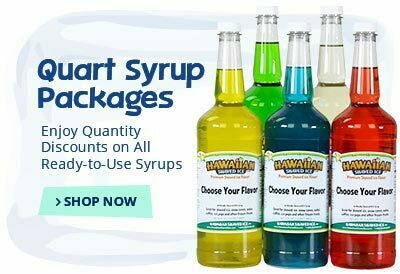 We feel like the cups keep the product colder longer and are easy to wipe clean if syrup happens to run down the sides. Foam cups are the most popular serving container for shaved ice. 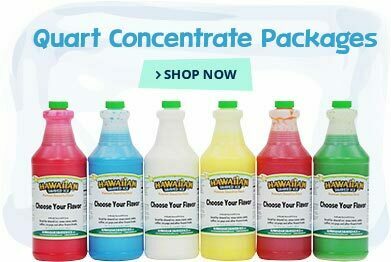 Although you can purchase white foam cups at Costco or Sam's Club at a cheaper cost we do offer unique, colorfully designed cups in 8, 12, 16, and 20-ounce sizes. Customers enjoy these cups because they are like no other and as I said before standing out from the competition is vital. 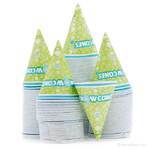 Flower cups/witches hats can increase your shaved ice profits! 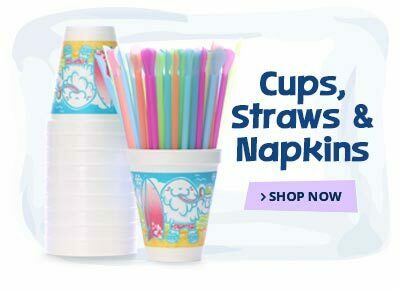 These bright and fun cups are a great way to attract customers and keep them coming back. These cups are designed to hold a little more ice, are great for catching those pesky drips on clothing and they're easy-to-hold or place on the table. Most vendors sell these cups of shaved ice for $3.00-$6.00 each. 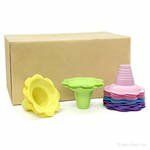 Flower Cups are available in packs or cases of 4, 8, and 12 oz. sizes. Snow cone cups are traditional served with snow cones rather than shaved ice. Our heavy-duty, 6-ounce, colorful snow cone cups make any snow cone a treat! Available in sleeves of 200 or cases of 5,000. Plastic spoons are normally served with each cup of shaved ice that goes our your serving window. We have two sizes of medium weight white spoons - regular size or long soda type spoons. Color changing spoons are loved by all ages. These spoons magically change colors every time they scoop a taste of their favorite shaved ice or snow cone. Available in cases of 1,000 in pink/purple, yellow/green, and white/blue. Spoon straws are a fun yet practical utensil. 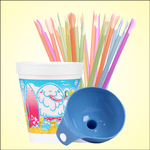 Each straw is specially designed with a spoon on the end so customers can eat their shaved ice or snow cone rather than drink (to each their own) Kid and adults love them! Available in packs of 200 or cases of 10,000. 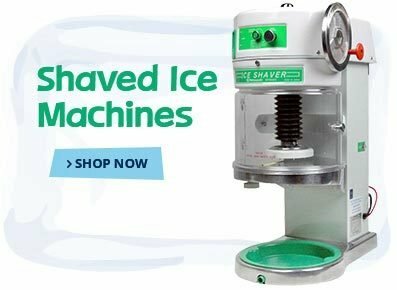 Dispenser napkins are the perfect size to be used in any shaved ice or snow cone business. Sold in a case of 10,000 or packs of 250. Napkin dispensers are important. Most shaved ice stands have a shelf under their serving window and place napkins there. I'm guessing you wouldn't want them to blow away so a dispenser definitely comes in handy. The napkins dispenser is designed to be used with our dispenser type napkins. A very popular item that's easy-to-use and easy-to-load! Slotted take-out trays are a must for large orders! These heavy-duty trays are designed to hold up to 4 paper or foam cups. Your customer will thank you! Sold in cases of 300.